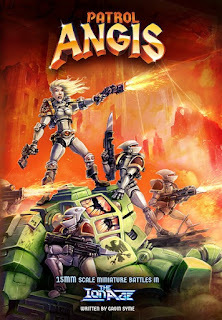 The Ion Age Blog: First Look at the new Patrol Angis book cover! A week or so ago I tempted you all by showing off the sketch of the coming new A4 larger format Patrol Angis game book. You can see this on our blog HERE if you missed it. The new cover is now ready and it is here to be seen! Sam Croes the lead designer at The Ion Age is a very talented fellow having taken up miniature sculpting after being a painter and digital artist first. 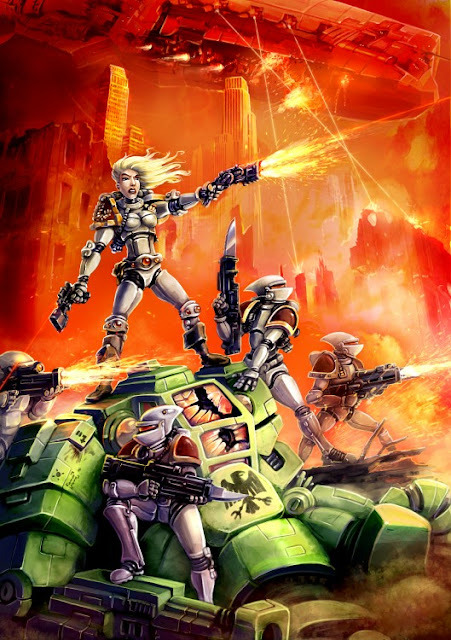 As you can see new cover is a scene of action with a group of Prydian Army Retained Knights giving fire to an invisible foe while atop a downed Havelock Battlesuit belonging to the League of Yordan. In the background is a city which is greatly reduced and burning from the ongoing civil war and above a Segurant class warship. We are considering a poster of this art if it is asked for. Since we announced the increase in format size of Patrol Angis and the coming soon Callsign Taranis books we have sold out of the original smaller A5 format book which is now a collectors item and no longer on our website. The new book and the game pack to go with it will return when we make the Early Supporter Offer which will be early next month. Details nearer the time. Awesome artwork. A suggestion: the whole title should be written with the same font, size and style.